So I know that we are officially in the holiday baking season, but I thought we should at least discuss one quick and easy dinner option. This is that time of the year when things start to get absolutely crazy, so it’s a good idea to have a few weeknight meals that don’t take a whole lot of time to whip up. 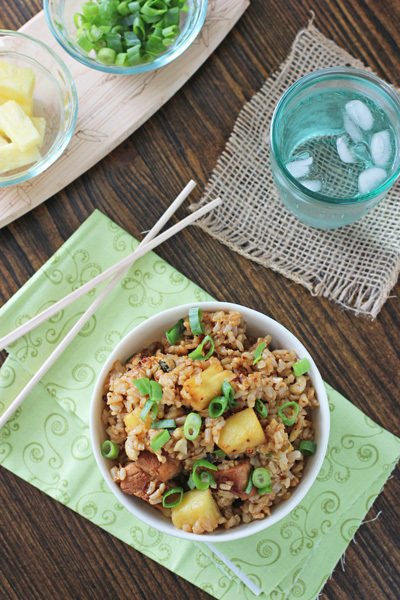 And let’s just say that I am very glad to have this pineapple pork fried rice in my repertoire. I’ve been making this dish for a long time and practically know it by heart. Which is good because I’m completely nutty and have also been planning a Christmas party for this coming weekend. The weekend right after we had family staying with us for Thanksgiving. The weeknight right after we all get back into the swing of things with work. I’m crazy, yes? Don’t answer that. I know I am but I’m still super excited. Bring on the holiday cheer. 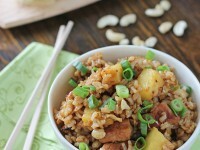 And easy fried rice. I’m planning to stuff my face with a bowl of this for lots and lots of energy. I’m gonna need it. 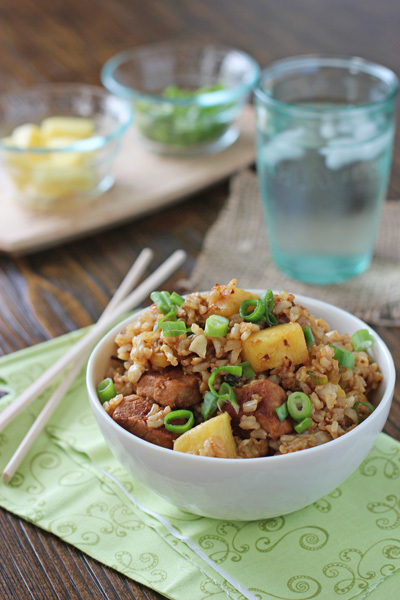 Recipe for pineapple pork fried rice. A quick and easy dinner option. 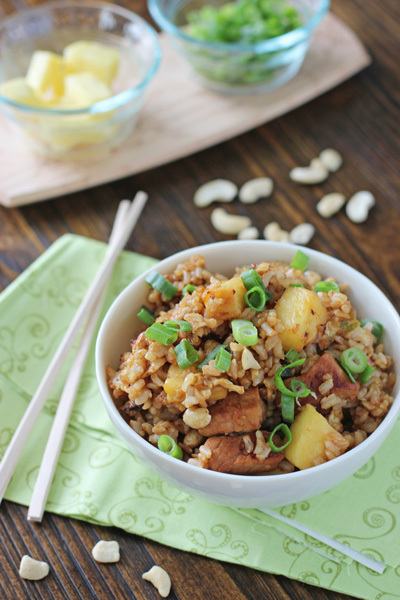 Packed with flavor from the spices, pineapple and pork, and cashews for added crunch. In a small bowl, add the pork, 2 tablespoons of the soy sauce and the chili-garlic sauce. Toss to combine. Set a large skillet over medium high heat. Add in 1 tablespoon of the olive oil. When hot, add the pork mixture. Cook, stirring occasionally, for about 4 to 5 minutes, until cooked through. Transfer the pork to a clean medium-sized bowl and set aside. Add the remaining ½ tablespoon olive oil to the skillet. Add in the green onions and cook for 1 minute. Next, add in the eggs. Cook, stirring constantly, until scrambled. Transfer the green onion / egg mixture to the bowl with the pork. Add the peanut oil, hoisin sauce, pineapple and remaining 1 tablespoon soy sauce to the skillet. Cook for 30 to 45 seconds. Add in the cold rice, breaking up any clumps, and cook until the rice is heated through, about 2 to 3 minutes. Add in the pork mixture and cashews, stirring to combine. Cook for 1 additional minute, until heated through.